Every semester my students who are studying architecture of sacred spaces come to hear my priest, Father Robert Arida, talk to them about the notion of sacred space in Orthodoxy. One year he was talking to them about the “expansion” of sacred space – how our liturgical celebrations are transforming physical space into the Kingdom of Heaven, how our participation in the mysteries brings the world into the Church and the Church into the world. The concept may seem abstract and difficult to grasp intellectually, but it is one that can be experienced. To me, it comes alive in the act of bringing Communion to those who are sick and infirm and cannot come to Liturgy. 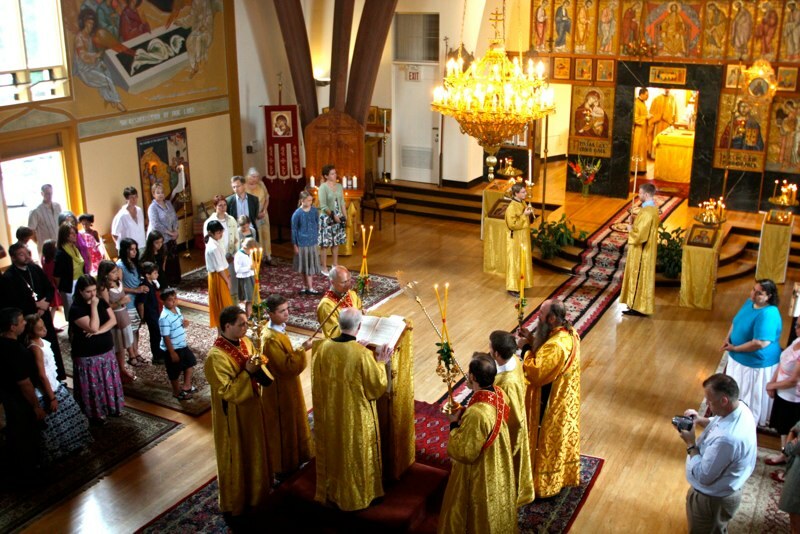 Being bilingual I am sometimes asked to assist when our clergy takes Communion to the Russian speakers. And it is then and there, in the squalor of old people’s dwellings or in the institutional sadness of nursing homes, that we experience the transformation of the surrounding reality, including space, by the mystery of the Eucharistic celebration. One such recent experience stands apart in my memory. A couple of months ago I was asked to help with administering the last Communion to a Russian parishioner who was dying in a nursing home. We were told that the old woman – I will call her R. – had but a few hours to live. When we got there R. looked like she really was dying, unconscious and making horrible “death rattle” noises. We called her name but she did not respond. We began the service and when I started reading prayers in Slavonic the dying woman moved just a bit, and became very quiet. She was able to receive communion although she did not open her eyes. After communion and anointing, a friend of R. who was there called her name again. Suddenly the old woman opened her eyes! We were all a little startled. The deacons started speaking to her. We told her that she had just received Communion and asked whether she knew who we were. She said yes, and thanked the clergy, and then thanked me for praying in Slavonic. She said she could hear every word and was happy. We had a little conversation with her before we left. R. died peacefully a few hours later. This experience of being in the midst of the Kingdom while being in the midst of the darkness and tragedy of human suffering and death is that experience of the new life which is with us here and now just as we are in the grip of despair and pain. And the glory of the Kingdom is not diminished by the squalid surroundings in which we find ourselves – when He is among us, the light shines in the darkness, and the darkness overcomes it not. This experience of being in the midst of the Kingdom while being in the midst of the darkness and tragedy of human suffering and death is that experience of the new life which is with us here and now just as we are in the grip of despair and pain. Glory to Jesus Christ. Thank you, sister, for your service to this woman.